Sculpture Size: 9.5 X 8.5 X 6.5 in. Tim's flower series has been incredibly popular with collectors, from "Paradise" to "Hibiscus" to the record-breaking "Tulip", which sold out in one day. Just in time for Mother's Day, Tim adds to the legacy with this colorful new sculpture. 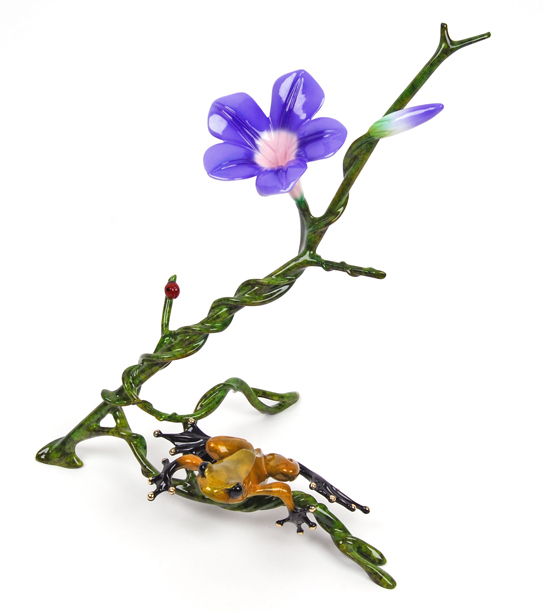 "Morning Glory" is a beautiful composition with a morning glory vine twining around a branch, presenting one perfect bud and one bloom above the yellow frog climbing below. The essence of springtime for your home.